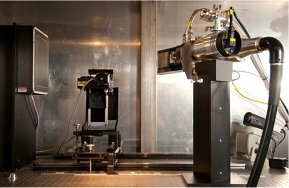 Scientists at Pacific Northwest National Laboratory are using X-Ray Microfocus Tomography (XMT), a nondestructive three-dimensional imaging technique, to analyze the structure of various types of organic and inorganic samples in solid or semi-solid forms. These characterization data are used by environmental research teams to develop effective, science-based solutions to solve complex environmental and climatic challenges. The XMT produces x-ray images that are similar to human x-rays used by the medical profession to diagnose and treat patients. Scientists use the XMT to x-ray organic or inorganic samples to obtain physical characteristics—including pore structure, porosity, and density. Scientists are using this three-dimensional imaging technique to analyze various materials, with the technology rapidly becoming a part of routine sample characterization. Scientists running samples on the XMT are supporting diverse projects such carbon sequestration in geologic formations, subsurface contaminant transport studies, and biological studies involving fish and other wildlife. These studies are helping scientists to better understand and predict environmental impacts, and advance understanding of subsurface science for environmental remediation. Scientists are currently using the XMT to produce x rays that show how cement reacts with carbon-dioxide ( CO2) and other minerals; this research is being conducted to determine the effects of injecting CO2 underground via cement-completed wells for long-term storage. "We frequently use XMT images to study how wellbore cement reacts with carbon-dioxide saturated water and mineral precipitates in our research on carbon sequestration and risk assessment of CO2 leakage. We also use time-sequenced images to better predict the response of cement to physical and chemical processes, and quantify the probability of CO2 release over time through wellbore cements," said Dr. Wooyong Um, a Pacific Northwest National Laboratory team lead for the CO2 wellbore project in the National Risk Assessment Partnership Program. X-ray image of cement and basalt column after exposure to CO2. Highlighted areas indicate calcite precipitates and fractures in the interface areas between cement and basalt. mixed particles, such as air pockets, fractures, precipitation, embedded objects, or chemicals. In addition to providing scientists with valuable characterization data in support of various U.S. Department of Energy environmental research studies, the XMT is being used in carbon sequestration research to study the porosity and reactions of chemicals in geologic materials. Toni Owen and Danielle Jansik.